Jada Pinkett Smith is one fit Momma! Pushing 43 years old, this celebrity mom can definitely pass as a 25-year-old. You would think with a body like that she spends hours in the gym but to our surprise, she says she is in and out of the gym in less than an hour! You know what? I don’t know if I feel stronger than ever, but I do feel better than ever. As I’ve gotten older, I’ve learned that it’s about being physical every day. You don’t have to go to the gym if that’s not your thing. You can go outside your door and walk around your block. You can take a brisk walk, a light jog, a slow stroll if you want! I feel like, as I’ve gotten, I look better than ever and I work out less. I’m never in the gym for [more than] 45 minutes. So what does Jada’s workout routine look like when she is in the gym? It looks like cardio in the morning and/or weight training in the evening. If you happen to catch Will Smith’s wife on a treadmill she’s most likely getting the most of her 45 minute session by doing sets of sprint intervals. For her weight training regimen, she does a lot of weighted squats and lunges and for her upper body she does a lot of bicep curls, lateral pulldowns and rows. If this is Jada’s secret to her anti-aging body, I think we all be running to the gym for a quick 45 minute session. In the September issue of Glamour, “Girls” star Zosia Mamet reveals she had and still deals with a serious eating disorder that has affected her whole life. It wasn’t until her dad made her get help that she realized her disease was affecting everyone, not just her. For the full interview, make sure to check out Glamour’s September Issue on stands now. Jessica Alba Loves Nachos… And Tequila! Jessica Alba is looking hotter than ever promoting the newest installation of Sin City around the country. Her most recent appearance was at Comic-Con revealing her go to indulgences. So what does someone with a perfect body like Jessica splurge on, “I love nachos so much… and tequila!”, she told E! News. Of course Jessica has to workout to maintain her looks, but her role in Sin City helped her stay in shape due to all the dancing she had to learn. “Looking back now, my friends are like, ‘Your body was really good when you were dancing. You should do that more often!” Alba said. The Real talk show host once dated Rob Kardashian in a very public relationship it 2007. Their love for each other was so “real” that they both got matching tattoo’s of each others names (except Adrienne’s name is on Rob’s ribs). But, when the couple split 5 years ago in 2009, their tattoo’s have lived on way past their love expiration date . 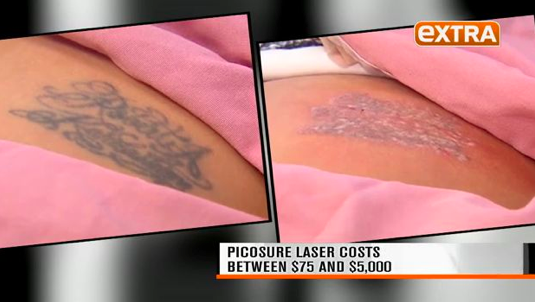 She is determined to get the tattoo removed for good but in a safe way, trying a new laser procedure called “Picosure” that will take 5 sessions. Tattoo removals can cost anywhere from $75-$5,000 depending on the location of the tattoo, size, ink color, and how many sessions it take to be completely removed. Halle Berry has been making her media rounds for her new television show “Extant”, about a female Astronaut who returns from a 12 month journey in space pregnant! Although this new sci-fi television series has a very interesting story line, everyone really wants to know about her new baby boy. 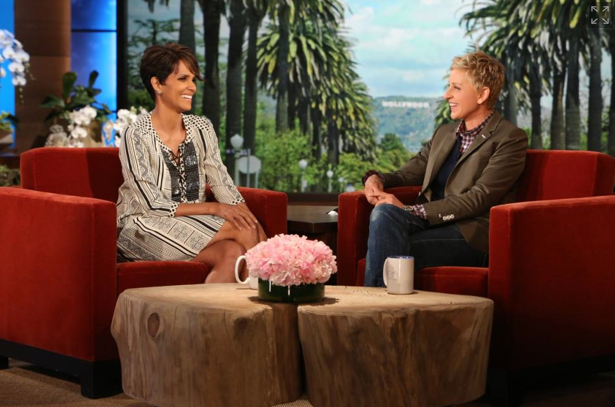 On Ellen’s couch, Halle opened up about giving birth to her second baby Maceo , and what it was like giving birth at age 46. She joked that while in the hospital she got a glimpse of her medical chart and realized it said “geriatric pregnancy“. In July of 2013, Halle Berry wed her second husband French actor Olivier Martinez in a private ceremony. Wondering what a geriatric pregnancy is, well it’s not a what it may sound like, it’s not your grandma having a baby. It’s when a woman who is 35 years old or older becomes pregnant. This was once an uncommon thing, but in today’s society 2 out of 10 pregnant women are now giving birth after the age of thirty. Wow!!! Now that’s serious. Happy you have it under control now Halle.